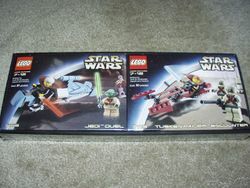 65106 Episode II co-pack is a co-pack with containing the sets 7103 Jedi Duel and 7113 Tusken Raider Encounter. These two sets could also be bought separately. This set included five Minifigures. The set included Douku's Speeder, which comes with 7103 Jedi Duel, and a speeder bike for Anakin, which comes with 7113 Tusken Raider Encounter. It also includes a crane and a moisture vaporator. It includes a total of 171 pieces. 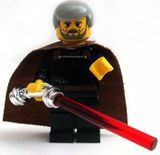 In total, this set featured five Minifigures, which are the following: Count Dooku (Episode II, yellow skinned), Yoda (Episode II, unprinted sand green head), Anakin Skywalker (as a Padawan), and Two Tusken Raiders. Facts about "65106 Episode II Co-Pack"